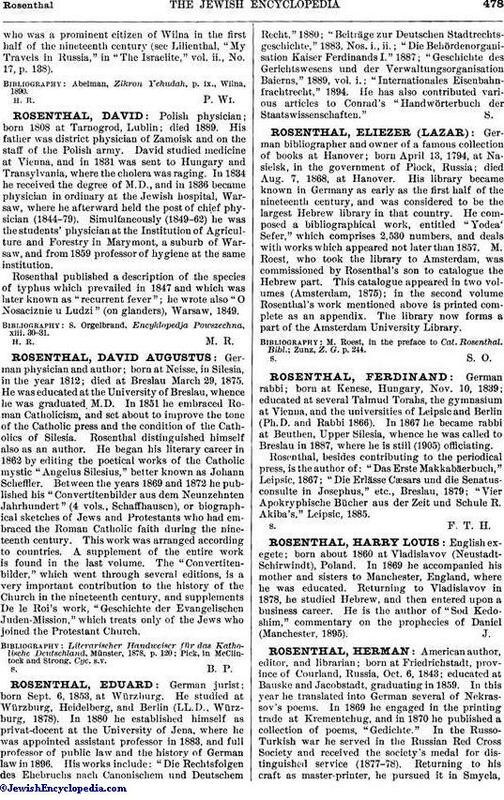 German physician and author; born at Neisse, in Silesia, in the year 1812; died at Breslau March 29, 1875. He was educated at the University of Breslau, whence he was graduated M.D. In 1851 he embraced Roman Catholicism, and set about to improve the tone of the Catholic press and the condition of the Catholics of Silesia. Rosenthal distinguished himself also as an author. He began his literary career in 1862 by editing the poetical works of the Catholic mystic "Angelus Silesius," better known as Johann Schefller. Between the years 1869 and 1872 he published his "Convertitenbilder aus dem Neunzehnten Jahrhundert" (4 vols., Schaffhausen), or biographical sketches of Jews and Protestants who had embraced the Roman Catholic faith during the nineteenth century. This work was arranged according to countries. A supplement of the entire work is found in the last volume. The "Convertitenbilder," which went through several editions, is a very important contribution to the history of the Church in the nineteenth century, and supplements De le Roi's work, "Geschichte der Evangelischen Juden-Mission," which treats only of the Jews who joined the Protestant Church. Pick, in McClintock and Strong, Cyc. s.v.